It's time for another reveal today. 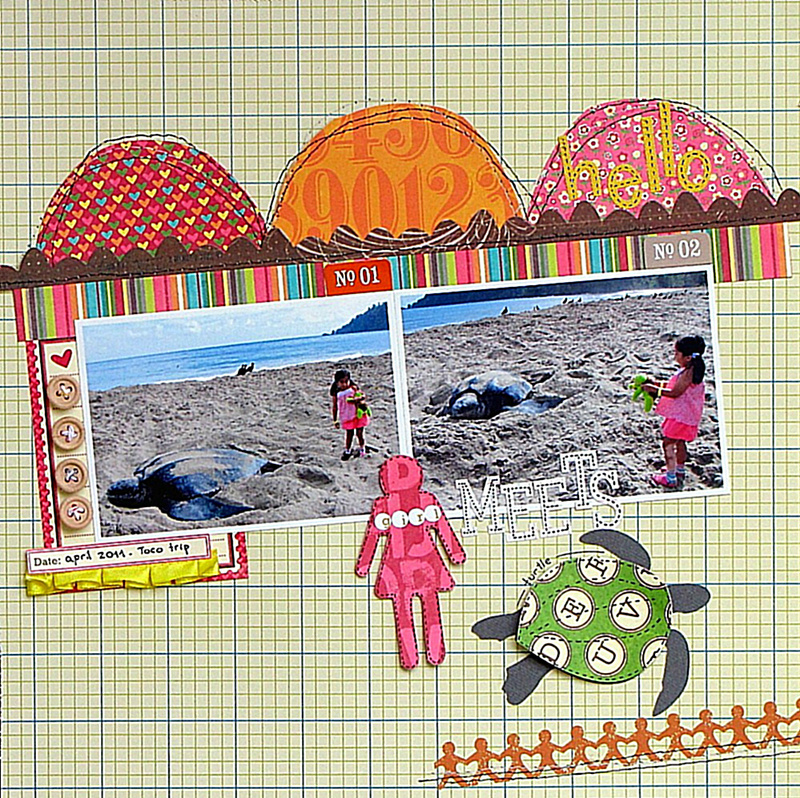 This layout shows my daughter Mia trying to talk to a giant leatherback turtle which was laying her eggs on Grand Rivière beach in the north east of Trinidad. It is one of the most amazing things I've seen in my life, and if you ever have a chance to come and see it, I recommend it! I used a Pagemaps sketch again, I loved this one because the semicircles on top of the pictures reminded me of the turtles's backs. Again, all the products used (except for the tiny letters on the girl -do you remember the girls I cut out form my card yesterday?) came with my kit. I loved that yellow ribbon, so much texture in it. I used my Silhouette to cut this turtle. So easy and so effective as a title! The next project I'd like to share is the cover of an accordion mini-album. It is a crazy design, but sometimes I like to go crazy, and I couldn't stop piling things on top of this one. So much goodness in this kit! 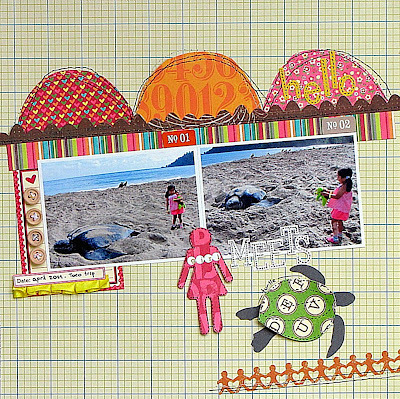 If you are thinking of getting this kit for yourself, visit Freehand Scraps and order one! You won't regret it! And remember I will announce a giveaway next ...! Adorable layout! What an amazing event to witness. Super cute kit!